The new 68-page handbook was launched by Minister of State for Sport Michael Ring TD this afternoon. Supporters pictured at Dáil Éireann this afternoon. 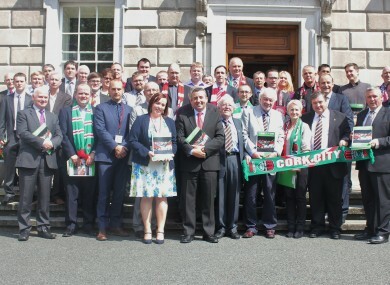 SUPPORTERS FROM ACROSS the League of Ireland came together in Dáil Éireann today for the launch of “Heart of the Game,” a new fans’ handbook aimed at improving fan ownership in Irish football. What is the “Heart of the Game” handbook? The whole aim of the handbook is to encourage League of Ireland supporters to get more involved in the day-to-day running of their football club. It was launched today by the Minister of State for Sport Michael Ring TD and, at 68 pages long, there’s plenty of reading in it. It is intended to serve as a reference document for fans, so there are plenty of “best practice” case studies from the league as well as expert advice on issues such as creating a legal body and applying for a licence. It is broken down into four main sections: legal, governance, culture and community. The handbook is the work of a collection of clubs, supporters’ trusts and fan organisations from across the country and grew out of a conference held in Cork last November. It is part of the “Improving Football Governance through Supporter Involvement and Community Ownership” project which is funded by the European Commission and led in Ireland by Cork City FC and the Friends of the Rebel Army Society (FORAS). It is aimed at building greater co-operation between fans who have a common interest in improving and protecting the game in Ireland. I’m interested. Where can I read it? The “Heart of the Game” handbook is available to download here. As well as the handbook, the project is developing an informal network to support a move towards greater fan ownership and share expertise. You can participate on Twitter @HOTG_ie, on Facebook here, or by visiting www.heartofthegame.ie. Email “What is the 'Heart of the Game' handbook -- and how can it help Irish football?”. Feedback on “What is the 'Heart of the Game' handbook -- and how can it help Irish football?”.